RSMSSB Syllabus: The Syllabus for RSMSSB Agriculture Supervisor Exam is made available here for all the interested and the eligible candidates. Also, here in this site, all the candidates can find the complete and detailed RSMSSB Agriculture Supervisor Syllabus. Also, all the aspirants can also find the RSMSSB Agriculture Supervisor Exam Pattern 2019 along with the RSMSSB Syllabus. Furthermore, the Rajasthan Subordinate & Ministerial Services Selection Board (RSMSSB) passes the notification to fill in all the available vacancies for the year 2018-19. So, all the eligible candidates, after accessing the complete and detailed Syllabus are advisable to download the Rajasthan Agriculture Supervisor Syllabus and RSMSSB Agriculture Supervisor Previous Question Papers along with their respective solutions that are made available to help out all the interested and the eligible candidates. Also, Check Notifications for Other State Government Posts. Here, we have all the complete details regarding the RSMSSB Agriculture Supervisor Exam 2019. So, now it is really easy for all those interested and the eligible candidates to know all the details like the RSMSSB Admit Card, RSMSSB Agriculture Supervisor Syllabus, RSMSSB Exam Pattern, RSMSSB Agriculture Supervisor Application date for the RSMSSB Agriculture Supervisor Exam 2019. So, all the aspiring and eligible candidates can prepare easily for the MP Vyapam Exam from all the updated latest RSMSSB Syllabus for the exam. RSMSSB Agriculture Supervisor Exam is a Multiple Choice based Test. In the Rajasthan Agriculture Supervisor Exam, Hindi, General Knowledge, and Agriculture related subjects are included. Total Marks for RSMSSB Agriculture Supervisor Exam is 400 marks. Time Duration for RSMSSB Agriculture Supervisor Exam is 2 Hours. Finally, candidates can download the RSMSSB Syllabus & RSMSSB Agriculture Supervisor Exam Pattern here. So, RSMSSB Admit Card will be available soon. Also, these hall tickets should be downloaded within a stipulated time. So, each candidate must have a copy of the hall ticket so as to be able to appear for the state recruitment entrance exam. 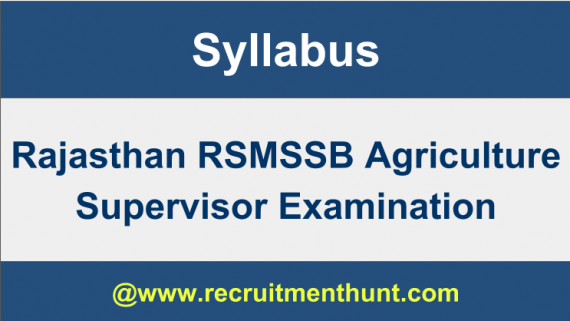 Also, applicants can make their preparation easier by following RSMSSB Agriculture Supervisor Syllabus. Also, they can download Rajasthan RSMSSB Syllabus. Furthermore, download the RSMSSB Agriculture Supervisor Exam Pattern on this article. Also, feel free to contact us in case of any queries. Also, for more Job Updates stay tuned to our site Recruitment Hunt.